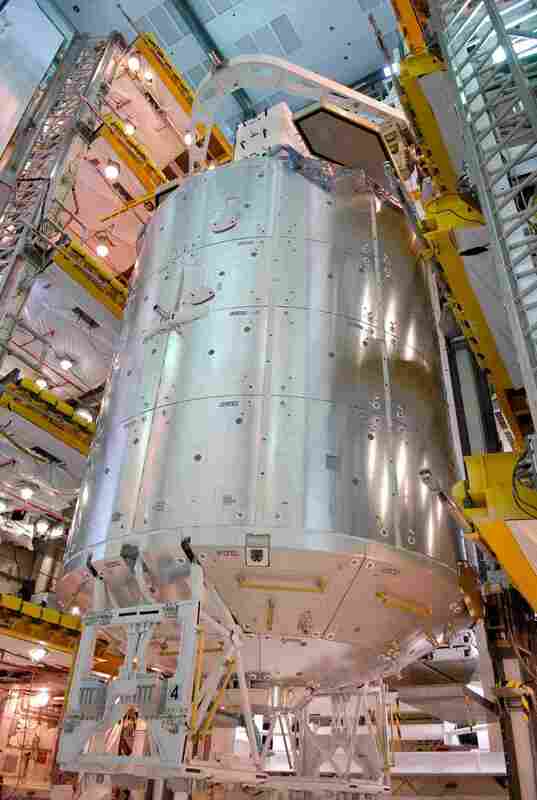 A few days ago, the European Space Laboratory Columbus has been moved into space shuttle Atlantis' payload bay. Atlantis space shuttle is being prepared for launch on Kennedy Space Center Launch Pad 39A. As announced by October 20 ARISS-Europe News Bulletin, the ARISS L/S-band antennas have been installed on the nadir of Columbus. Appended picture (Photo credit NASA/Kim Shiflett) shows Columbus in the payload changeout room at Kennedy Space Center. The changeout room is the enclosed, environmentally controlled portion of the rotating service structure that supports cargo delivery to the launch pad and subsequent vertical installation into the orbiter payload bay. ARISS antennas are clearly visible on MDP’s (Meteorite Debris Panels) COL/01-07 and COL/02-07. Columbus will fly to the International Space Station on mission STS-122. The launch is targeted for December 6, 2007. The Columbus laboratory module is approximately 7m long and 4.5m wide, allowing it to hold 10 large racks of experiments. Presently the ARISS working group is developing plans for the construction of an onboard wideband digital transponder (L-band uplink /S-band downlink). Downlink digital ATV is also planned.